Putting a Skills section on your resume is a great way to show hiring managers what you can do for them, while also including relevant keywords on your resume. So I’m going to walk you through how to write this section with a few examples, and I’ll also reveal the top mistake to avoid if you want to get the interview. Let’s look at some good examples of resume Skills sections. Your goal when writing this section is to highlight your most relevant skills for the job, all in one place. So you want the list to be easy to read. I suggest one or two columns. And you don’t just want to list random skills. And you don’t want to list the same skills for every job! You really want to research the job and company (starting with the job description) and put the skills and keywords THEY mention. This is called “tailoring” your resume and will immediately boost the number of interviews you receive. I wrote a guide on the easiest way to do this HERE. (It’s much easier than people think). So you really need to be looking at the specific job description for keywords. Once you’ve done that, you’re ready to put together your Skills section. This sample resume skills section is for a salesperson. You can see it contains a lot of keywords, and also highlights what this person is best at. That’s what you should aim to do. Remember, don’t just guess which skills and keywords the employer wants. Study the job description. This is another example of a simple layout for this section on your resume, this time using two columns. Choose a format that is simple and non-distracting. You want the reader’s focus to be on your skills and qualifications, not on your resume’s formatting. How Many Skills Should You Put? This depends a lot on your job and industry. An experienced software engineer might list 20-25 skills. Someone with a few years of experience in a field like sales or customer service might only need 8-10 skills. Overall I’d say you should have somewhere between 8 and 25 skills. The biggest mistake I see with the resume Skills sections is putting it too high up on the resume. Sometimes it’s the first thing people list after their contact info and a brief intro or resume summary paragraph. In my experience, this early on your resume, hiring managers don’t want to see a big list of skills with no reference to where each skill was used. Before this, they want to see your work history and a chronological view of what you’ve done. Skills sections don’t provide this because they lump everything together in one big list. So if you put this section too high on your resume, the hiring manager might skip it and look for your employment history instead. After your contact info and a brief intro, I recommend diving right into your employment experience section. And always start with the most recent work. If you have no past work, put internships. If you have no internships or past work, put educational experience… and don’t just put your degree… list bullets with specific projects and accomplishments, just like you would with work experience. THEN, you can put your resume Skills section. If you follow this advice and put it on the bottom half of your resume, it’s a nice recap/summary of your overall skill set, and hiring managers will enjoy reading it. Unfortunately, many job seekers don’t realize this and put their Skills section far too high up on their resume, causing it to be skipped-over! If you need more help with the structure of your resume, I wrote a detailed post on what to put on a resume, including the order. Along with looking at the job description for the role you’re applying for, you can also look at job descriptions for roles you’ve previously held. Which skills did you use most? You can also look at LinkedIn’s list of skills that are available for your profile. Or look at peers/colleagues on LinkedIn and see which skills they’ve chosen. You can also take a course via LinkedIn Learning and then add that to your Skills section. This is a great option if you’re job searching after being unemployed, because it shows employers you’re keeping your skills current and staying active. And as one more option, you can review your most recent job, even if you don’t have a job description for it. What did your typical week look like? Sit down and think about which skills you used the most throughout a normal week. 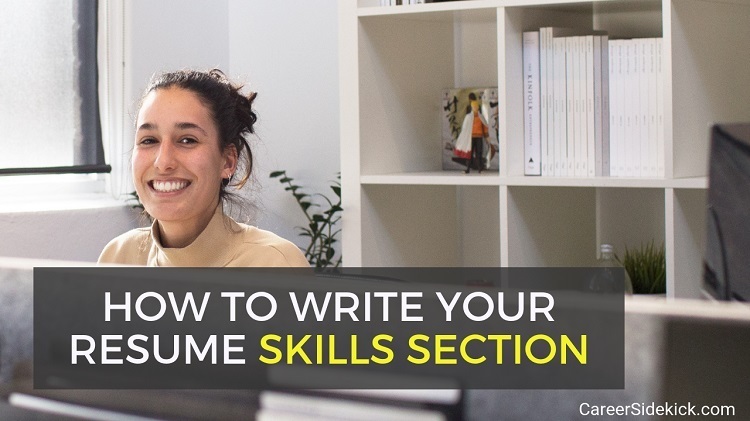 That should help you come up with more ideas of which skills to include when writing your resume. If you say you’re an expert in Microsoft Excel, Java Programming, Phone Sales or anything else… you need to be ready to defend this in an interview. They’re going to ask where and when you’ve used this skill, and what makes you an expert. I’ve made this mistake early in my career and it cost me the job. And definitely don’t list skills you’ve never used. Even if they do hire you, you could immediately be fired if they discover you lied about your skills in your interview. Overall, be honest when listing skills on your resume, and review your own resume before an interview so you’re not caught off-guard by any questions they ask. The post How to Write a Resume Skills Section (with Examples) appeared first on Career Sidekick.